You're being ridiculous! – You're being ridiculous! She writes of the sounds of bystanders that she can still to this day hear ringing in her ears, tutting at her apparent inability to control the children in her care and of the mayhem that follows them everywhere, along with her repeated admonition to them of “you’re being ridiculous!” . Claire has experienced those awful questions in the most public of places concerning the differences between boys and girls and has been informed by a six year old on the habits of mating Turtles. Have you ever heard of pee wars? Have you ever crash landed in a World War II plane and lived to tell the tale? Not to mention some of the topics discussed at the dinner table that would make even the most bold of us blush. Claire won’t mind you laughing at her or with her and she will leave you knowing, in no uncertain terms, just how much she grew to love these boys and how they will always have a special place in her heart. She hopes that maybe one day they will come back into her life to remind her of their own memories. C. E. A. FORSTER, is a pen name and an anagram of Foster Care. The purpose of my writing with a pen name, as I hope you can appreciate, is to protect not just my identity but the identities of all the children I have cared for and will refer to. The book is factual, but all names have been changed. I live in the UK. Aside from fostering, I live a fairly normal life. I go out to work, I pay a mortgage, I do all the fun but sometimes mundane things that most of us do day in day out. I never would have imagined that I could have written a book and I suspect that this is a one off so please just enjoy it. 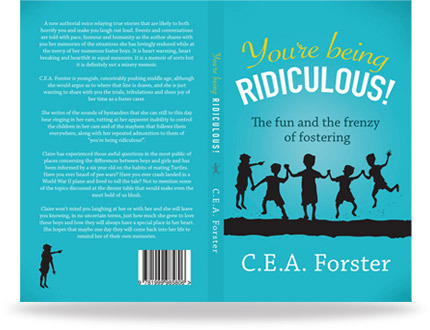 This book was originally written for my own benefit, so that in my old age I would never forget the love and the laughter that being a foster carer has brought to me. I simply want to share it with you.